Bush Dog Puppies Arrive at Stone Zoo! NBC10 Boston, necn and the Stone Zoo asked you to help us name two bush dog puppies — one female and one male — born last year. We received more than 100 name suggestions from viewers. The zoo then narrowed them down to three female names and three male names and asked you to cast your votes. And the winners are... Izzy and Milo! What's your pick for the name of the female bush dog pup? What's your pick for the name of the male bush dog pup? The newly-named pups made their exhibit debut April 12 at the Stone Zoo, just in time for school vacation week. They were born on Nov. 25, 2018, and had been bonding with their parents behind the scenes. The Stoneham, Massachusetts, zoo first welcomed bush dogs to their animal family when the Caribbean Coast exhibit opened in June 2018. The female, named Valentia, came from the Prague Zoo in the Czech Republic, while the male, named Mato, arrived from Sequoia Park Zoo in California. 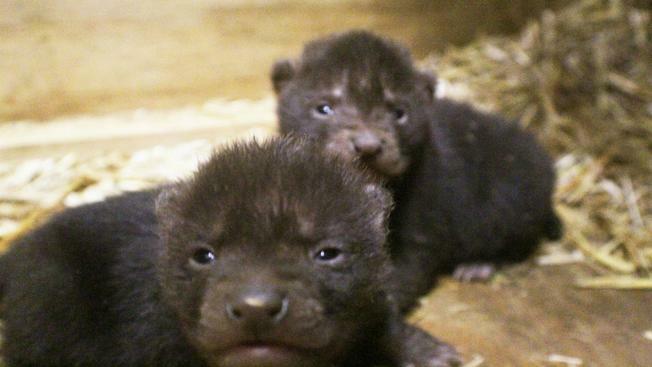 The pups’ birth is a first for Zoo New England, and is the result of a recommended breeding by the Bush Dog Species Survival Plan, a cooperative, inter-zoo program coordinated nationally through the Association of Zoos and Aquariums. Species Survival Plans help to ensure the survival of selected species in zoos and aquariums, most of which are threatened or endangered, and enhance conservation of these species in the wild. Listed as a near threatened species by the International Union for the Conservation of Nature, these small mammals can be found in extreme eastern Central America and northern South America, south to Paraguay and northeastern Argentina.